USA defender Omar Gonzalez says coach Jurgen Klinsmann has told his squad to change the dates of their flights home because he thinks they will reach the World Cup final on 13 July. 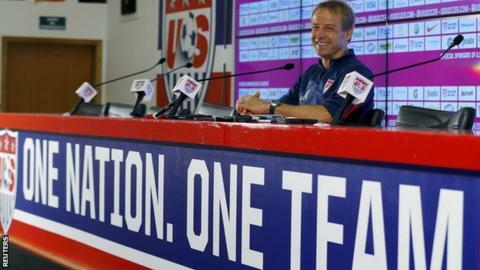 The USA face Belgium in the last 16 on Tuesday after qualifying from a group including Ghana, Portugal and Germany. "Jurgen has been nothing but positive," said Gonzalez. "He's telling us to change our flights to 14-15 July because we're going to be here until the very end." "That just speaks volumes of how positive he is, how much he believes in this team. "It trickles down to all of us. That means that we're all as confident as he is and that we all believe in this team. We plan on being here a few more weeks." USA qualified from Group G on four points, following a win against Ghana before they were denied victory against Portugal after a late goal from Silvestre Varela. Klinsmann's side then lost to his native Germany but qualified for the second round on goal difference. "You get to this part in the tournament and it's clear that it is about whoever prepares better," said USA midfielder Michael Bradley. "It is about whoever's more committed on the day, whoever makes more plays over the course of 90 minutes, whoever's willing to have a group of guys on the field who fight and are so determined to come off the field a winner. Those are the things that count. "So, for us, it's about using the time in between these games to recover - physically, mentally - and know that when we step on the field it's going to be a hard game, one that tests us in every way. "But like we keep saying we're excited about it and we'll be ready to go."